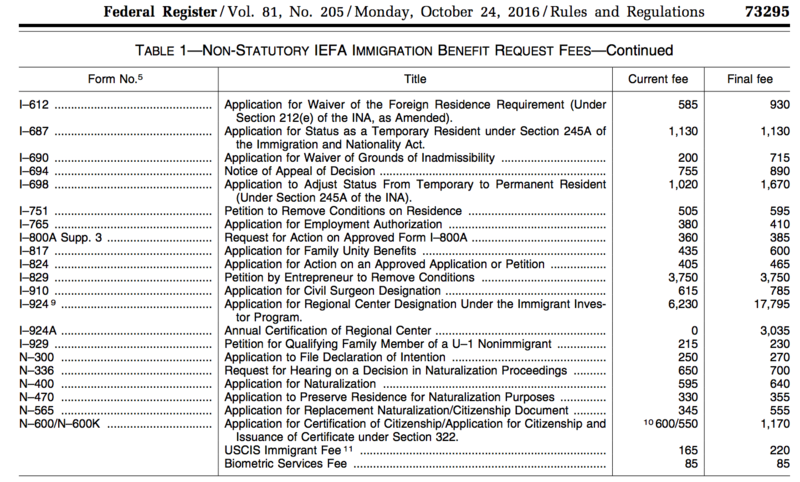 Today, October 24, 2016 the Department of Homeland Security published the final rule increasing fees for certain immigration and naturalization petitions processed by U.S. Citizenship and Immigration Services (USCIS). Overall the Department of Homeland Security increased filing fees for certain petitions by an average of 21 percent. 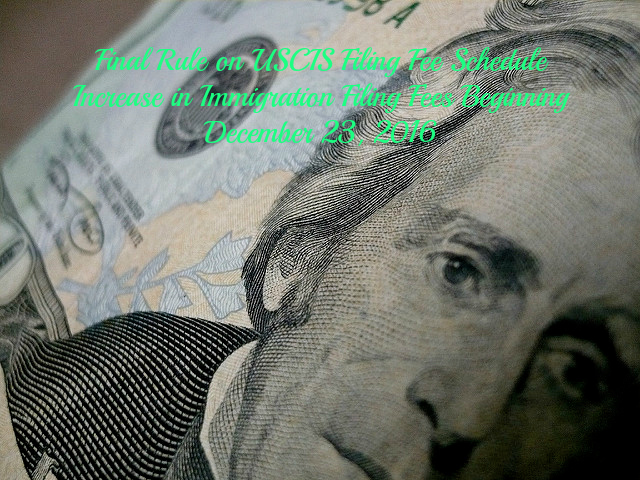 The new fees will be enforced by USCIS beginning December 23, 2016. The fee schedule has been adjusted following the agency’s decision to conduct a comprehensive review of filing fees for fiscal year 2016/2017. USCIS determined that an adjustment in the filing fees would be necessary in order for USCIS to recover costs for services expended and maintain adequate service. The proposed fee schedule was first published on May 4, 2016. The final rule clarifies that all persons applying for immigration benefits may be required to appear for biometrics services or an interview, and thus must pay the biometrics services fee accordingly. The EB-5 Immigrant Investor Visa Program will be most heavily impacted by the new fee schedule. The new filing fee for Form I-924, Application for Regional Center under the Immigrant Investor Pilot Program, will increase by a rate of 186% requiring Regional Centers seeking designation under the program, to pay a filing fee of $17,795 instead of the current rate of $6,230. Regional Centers will be required to pay a $3,035 annual fee to certify their continued eligibility for the designation. The filing fee for the I-526 Immigrant Petition by Alien Entrepreneur, an application associated with the EB-5 visa program, will increase to $3,675, a 145% increase up from the current rate of $1,500. The filing fee for an investor’s petition to remove conditions on residence remains unchanged. USCIS has established a three-tiered fee schedule for naturalization applicants filing Form N-400 Application for Naturalization. First, the fee schedule includes a standard filing fee for most applicants, from a rate of $595 to $640. Second, DHS has established a reduced fee of $320 for naturalization applicants whose household income is greater than 150% but less than 200% of the Federal Poverty Guidelines. Third, there will be no filing fee for naturalization applicants who are members of the military, applicants with approved fee waivers, and others who may qualify for a fee waiver according to sections 328 or 329 of the Immigration and nationality Act (INA). Filing fees for Forms N-600 Application for Certificate of Citizenship and N-600K Application for Citizenship and Issuance of Certificate under Section 322 will increase to $1,170 from a rate of $600/550. Eligible applicants may apply for a fee waiver. The filing fee for Form I-129, Petition for a Nonimmigrant Worker, will increase to a fee of $460, from the current rate of $325. The filing fee for Form I-140, Immigrant Petition for Alien Worker, will increase to $700, from the current rate of $580. The filing fee for Form I-485 Application to Register Permanent Residence or Adjust Status, will increase to $1,140 up from the current rate of $1,070 (including biometrics). The proposed rate will include the cost of concurrent filing of Form I-765, Application for Employment Authorization and Form I-131, Application for Travel Document to return to the United States after temporary foreign travel. Applicants under 14 years of age, submitting a Form I–485 with a parent, are subject to a $750 discounted filing fee for the Application to Register Permanent Residence or Adjust Status, Form I–485. Only certain applicants will be eligible. Please review the I-485 instructions beginning December 23, 2016. 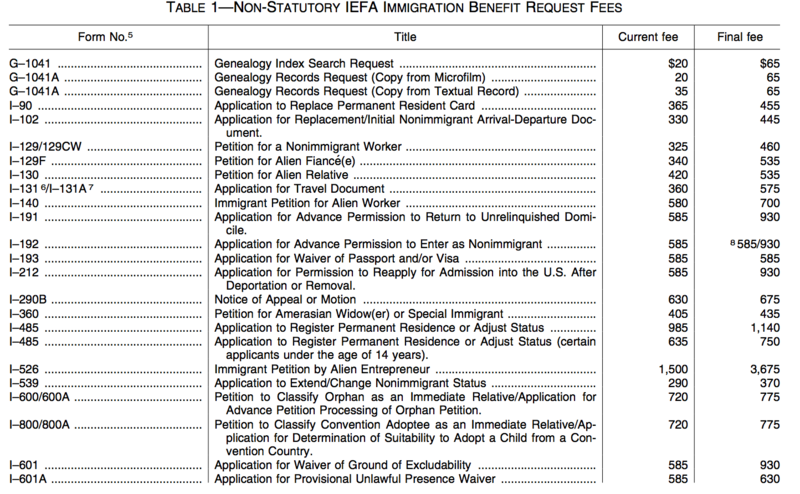 The filing fee for the I-130 Petition for Alien Relative will increase from $420 to $535. The I-129F Petition for Alien fiancé will increase to a fee of $535 from the current fee of $340. The filing fee for the I-751 Petition to Remove Conditions on Permanent Residence will increase from $505 to $595. The filing fee for the I-131, Application for Travel Document, will increase to a fee of $575 from the current rate of $360 for applicants seeking advance parole and re-entry permits. Adjustment of status applicants who have filed Form I-485 on or after July 30, 2007, and paid the I-485 filing fee, will not be required to pay a filing fee for Form I-131 if their Form I-485 remains pending with USCIS. The filing fee for the I-765 Application for Employment Authorization will increase from $380 to $410. This increase will apply to applicants for work authorization, including foreign students approved for Optional Practical Training, spouses of certain nonimmigrant visa holders, recipients of DACA and TPS applicants. USCIS has removed regulatory provisions preventing rejection of immigration petitions including dishonored checks, and failure to include biometrics fees. The agency is now authorized to reject an immigration or naturalization benefit request, if the applicant has included a dishonored check or did not include the required biometrics fee. The remitter will no longer be able to correct the deficient payment, and instead must re-file the application including the required fees. USCIS will submit all rejected payments to the applicant’s bank for a second time to be cleared or rejected. If the check is rejected for a second time, the case will be rejected for non-payment. If the case has been approved, a notice of intent to revoke will be sent to the applicant. The filing fee for the I-90 Application to Replace Permanent Resident Card will increase from $365 to $455. The filing fee for the I-212 Application for Permission to Reapply for Admission into the U.S. after deportation or removal will increase from $585 to $930. The biometrics service fee will remain at $85, as well as the premium processing fee at $1,225. Please note that Form I-912 Request for Fee Waiver, may be filed for any family-based non-immigrant visa petitions, if the applicant can demonstrate their inability to pay based on any of the following: financial hardship, household income is at or below 150% of the Federal Poverty Guidelines, or the applicant, spouse, or head of household is currently receiving a means tested benefit. For a list of petitions that qualify for a fee waiver please review the I-912 instructions. To read the complete final rule please click here. For information regarding immigration visas please visit our website.